When looking for Blue Mountains Accommodation you have came to the right place. We have a wide range of B&B, Houses, Cottages, Hotels and Motels. 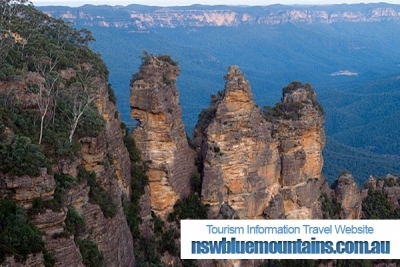 The Blue Mountains region includes Australia's most accessible wilderness area. Nowhere are you more than a few minutes from the edge of the spectacular escarpment and adventure. Yet it has some of Australia's finest for regional accommodation, dining and shopping. Our wide range of Blue Mountains accommodation lets you enjoy all the area has to offer. From bushwalking and horse riding, to abseiling and rock sports, to vineyards and culinary delights; From art galleries, to beautiful scenery and places of Aboriginal cultural significance. We have Blue Mountains hotels to suit every budget and holiday need. Whether taking a bushwalk or the Scenic Skyway cable car, our Blue Mountains hotels are a perfect base for exploring the breathtaking natural beauty of the area, especially the Jamison Valley, which includes the Three Sisters, Katoomba Falls and Mount Solitary. The rugged pristine environment can also be appreciated by taking a paddle wheeler cruise along the scenic Nepean gorge or an abseiling or adventure tour in The Jenolan Caves. The Blue Mountains also makes a great base for appreciating the art and culture of the area: From antique centres, to arts and crafts displays from the Norman Lindsay Gallery and Museum, to Casey's vineyard, which specialises in cool climate wine. The pioneering spirit of the area can be appreciated at the Megalong Australian Heritage Centre, which is a celebration of Australian rural life where you can learn how to crack a whip, muster, milk a cow and shear a sheep. The Zig Zag Railway is also a monument to the pioneering spirit. Built in the 1860s to enable produce to be taken to Sydney from the Blue Mountains, the railway was regarded as one of the engineering wonders of the Victorian age. Our hotels in the Blue Mountains act as a great base for exploring the areas rich Aboriginal cultural history. The origin of the Three Sisters rock formation is explained by Aboriginal dreamtime myth of three sisters of the Katoomba tribe who fell in love with three brothers of the neighbouring Nepean tribe. The unions where not permitted under tribal law, and a when a tribal battle broke out a witchdoctor turned the three sisters to stone in an effort to protect them. The spell was unable to be reversed after the witchdoctor was killed and the rock formations stand as a reminder of the battle to future generations.